Government plans for an eight-lane boulevard near the state ferry terminal will move forward, after the Alliance for Pioneer Square dropped its legal challenge to what it called “a daunting environment” for people walking. 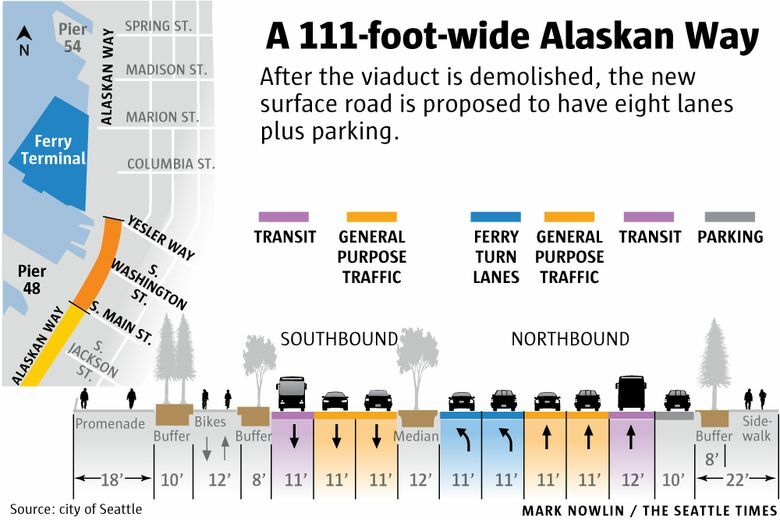 In return, the city of Seattle promised to remove two bus lanes — and make the 111-foot-wide roadbed narrower — once Sound Transit light-rail trains to West Seattle begin running, aimed for 2030. The waterfront Alaskan Way is to be rebuilt after demolition of the old Alaskan Way Viaduct, to follow the early-2019 opening of the Highway 99 bypass tunnel. The disputed segment covers 1½ blocks from South Main Street to Yesler Way, to provide a transit lane in each direction for about 600 buses daily including RapidRide C from West Seattle Junction and RapidRide H (currently Delridge Way Route 120); four general traffic lanes to include trucks; two left-turn lanes for ferry users; and northbound curbside parking. The Washington State Department of Transportation insisted on two ferry lanes, part of state Highway 519. King County Metro Transit will consider reducing waterfront bus traffic near Pioneer Square using the future Lander Street overpass, in the 2020s. The space created by removing bus lanes might be converted to landscaping, sidewalks or parking, said Marshall Foster, city waterfront director.